In general, opposing WWII planes sought the advantage in altitude and relative position. Seizing a position in the sun was always desirable, because the glare could almost blind an attacked pilot. But because the sun’s position rarely corresponded with the mission, it was a luxury that could not be counted on. Viewed from the side, the wings of an airplane are curved and tapered on the top, flat underneath. The thrust generated by the propeller creates an apparent air flow that strikes the wing. Due to the curvature in the wing, air moving over the top of the wing flows more quickly than that passing underneath. Because of the Bernoulli effect, the faster-moving air on the top creates less pressure than does slower-moving air along the botom. The disparity in pressure creates a lift, which is the counterpart of gravity. When the plane moves through the air it encounters friction, or drag. Thrust and drag are also natural counterparts.When flying at a steady speed in perfectly level flight, the twin counterforces that govern performance: lift-gravity and thrust-drag are in equilibrium. angle of attack (angle of the wing relative to its flight path) changes the Bernoulli effect is amplified, causing more lift. Drag, however, is also increased, slowing the aircraft down. In a climb, therefore, due to the result of the twin forces of drag and lift, the aircraft rises due to lift but also slows due to drag. 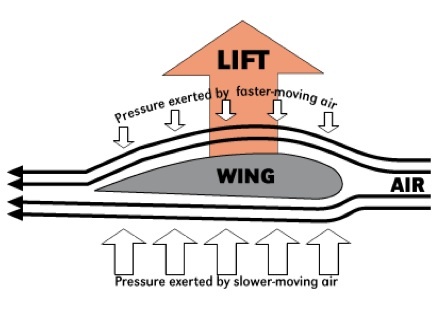 Something similar takes place during a turn: wing are no more parallel, so pilot require more lift to stay in the same altitude and raises the aircraft nose, also slowing down the plane. Speed and altitude are the trade-offs during maneuvers.